However, a closer examination reveals that the multitude of cases is soon reduced to only a few reports, which have been quoted ad nauseam by the authors. The same few cases have been retold again and again, and everybody appears to quote just about every author in the field of speculative archaeology. Nobody has ever checked whether these cases are valid. ( That said, the book by Cremo & Thompson is the notable exception and offers new material ). This is a preliminary study of the material so far published and does not claim to be complete. The following listing includes all cases known to me. Information on further cases missed here is certainly wellcomed. Each item starts with the place where the footprint was found, then a brief description of the print follows. The sources are given as complete as possible so that any sociologically inclined researcher may look up how the individual stories became embellished in time. This is followed by a short discussion, and if possible, identification of the origin of the print. Antwerp : In 1919, Wilhelm Freudenberg discovered "possible human footprints" in the Early Pliocene to Late Miocene formation ( 4 to 7 million years old ) of a clay pit near Meuleken. A detailed description of the finds, including sketches, can be found in Cremo et al. ( 1993, p. 280 ). Lower Saxony, Harz Mountains : The hoofprint of the giant Bodo’s horse is still shown at the Rosstrappe. It is a naturally eroded depression in rock. Saxony, Hillburghausen : In 1834, Professor F.K.L. Sickler discovered numerous traces in red sandstone which were "an almost exact replica of the print that would be made by a human hand". The prints were identified as those of Chirotherium, a species of reptile ( Carrington 1960, p. 149 ). Baden-württemberg, Baden-Baden : According to a mural in the city itself, the Teufelskanzel rock ( devil’s pulpit ) still bears the hoofprints of the devil. I searched this large rock outcrop for several hours but couldn’t find any footprints. I assume they were destroyed during the construction of a pavillon there. 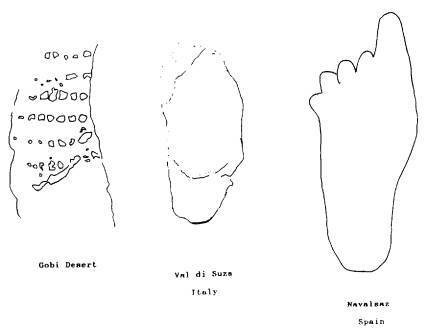 Piemont : The devil left a print of his foot ( which looks pretty shoe-like ) near Caprie in the Val di Susa. It is without doubt just a naturally eroded cup ( Kolosimo 1991, p. 103-104 ). Rome : At the site on the Via Appia near Rome where, according to legend, St. Peter met the Lord, a small church stands over Jesus’ footprint in stone. The church of Santa Francesca Romans in Rome still lies over a print of St. Peter’s kneeprint in stone ( Thiede do d’Ancona 1997, p. 217 ). Navalsaz, Soria : 500 tyrannosaur tracks and a single human one were found alongside in layers 70 million years old ( Benitez 1975, p. 64&79 ). The photo shows just a natural depression in the stone. Lochgilphead, Argyll : In a footprint in solid rock the kings of Dalriada stood when they were inaugurated ( Bord, 1987, p. 70 ). The print has clearly been carved by humans. Glenmoriston near Loch Ness : A print marks the spot where in 1827 a travelling preacher was annoyed by the ignorance of some of his listeners ( Witchell 1976, p. 37 ). Gobi Desert : In 1959, the Chinese scientist Prof. Dr. Tschu Myn Tschen ( Tschou Ming Tschen/Tschau Ming Tschen/Chow Mingchen ) discovered a fossil shoeprint with a ribbed sole in sandstone two or 15 million years old. It had European size 43 ! ( Smena, Moscow, Nr. 8, 1961 ; Tomas 1976, p. 161 ; Charroux 1974, p. 72 ; Mooney 1976, p. 25 ; Schneider 1976, p. 52 ; Berlitz 1978, p. 189 ; Dopatka 1979, p. 408 ; Fiebag 1982, p. 62 ; Kolosimo 1991, p. 103 ). A plate in Tomas’ book shows the alleged footprint, and is nothing else but fossilised wind or water ripples in sandstone. This seems also to be the identification made by Dr. Johannes Fiebag, a geologist and supporter of the ancient astronauts theory, when in his discussion of the Paluxy prints ( see below ) he adds that "similar finds discussed in the popular literature are just ripple marks" ( Fiebag 1995, p. 263 ). Srinager, Kashmir : There is an alleged grave of Jesus in Srinager, with "the imprint of a human foot set into what appears to be either concrete or stone. The footprint is positioned on the lower left hand corner near the foot of the tomb ... The most peculiar feature of the foot is its length and width, roughly equivalent to a size 12 or 14 man’s shoe" ( Benjamin 1989, p. 24 ). That is size 45, European style, and the prints include depressions where Jesus’ wounds would have been ( Däniken 1994, p. 173 ). There are many popular books about "Jesus in India", and most contain a picture of the footprint, which appears to be carved. Jerusalem : Jesus’ footprint can be found in solid rock at the ground of the Resurrection Chapel in Jerusalem ( Thiede & d’Ancona 1997, p. 217 ). Also in Jerusalem, in the rock outcrop on which the Mosque of the Rock stands, the handprint of an angel can still be seen - the heavenly messenger tried to stop the rock from following Muhammed during his journey into heaven ( Bamm 1955, p. 341 ). According to Förster ( 1995, p. 156 ) the print is not that of an angel’s hand, but from Muhammed’s horse. Adam’s Peak : This is the place where Muslims still show Adam’s footprint. It is in solid rock and 1.67 by 0.76 metres in size. A temple now stands over the site. 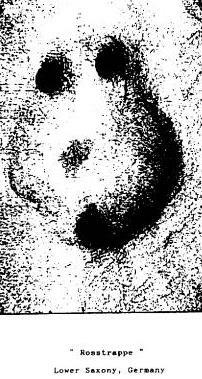 Hindus believe the footprint is that of Shiva, Buddhists that it is Buddha’s and Christians say the apostle Thomas left it ( McNeil 1992, p. 122 ; Förster 1995, p. 155 ). In spring 1983, an expedition from the Institute of Geology of the Turkmen SSR found over 1 500 dinosaur prints in the southeast of the republic. Professor Kurban Amanniyazov, Academy of Sciences, explained : "We’ve discovered imprints resembling human footprints, but to date have failed to determine, with any scientific veracity, whom they belong to, after all. Of course, if we could prove that they do belong to a humanoid, than it would create a revolution in the science of man. Humanity would "grow older" thirty-fold and its history would be at least 150 million years long" ( Moscow News, Nr. 24, 1983, p. 10 ; Corliss 1985, p. 28 ; Cremo et al. 1993, p. 458 ). Gravelbourg, Saskatchewan : In 1910, human footprints in granite were discovered in Gravelbourg, said to pre-date humans by millions of years ( Pursuit, July 1971, p. 69-70 ; Dash 1997, p. 39 ). Allegedly, a 1822 issue of the "American Journal of Science" reported human footprints in solid rock found in "the Mississipi Valley near Arizona and New Mexico" ( Däniken 1977, p. 323 ; Dopatka 1979, p. 408 ). Something appears to be slightly faulty in geography here but what else should be expected from authors of ancient astronauts books ? 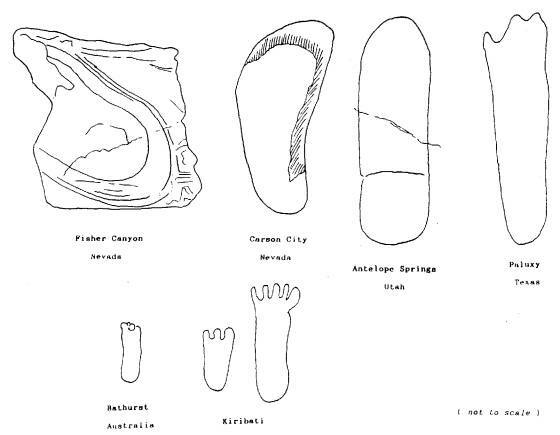 Rockcastle County : Geologist Dr. Wilbor G. Burroughs reported in 1938 that he had discovered ten human footprints 10 miles north of Mount Vernon in Carboniferous sandstone layers 250 million years old ( Holiday 1973, p. 98 ; Däniken 1977, p. 322 ; Dopatka 1979, p. 408 ). Each footprint had five toes, and they averaged 9.5 inch in length being 4.1 inch in width. Additional and similar footprints were also found in Jackson County, and in Pennsylvania and in Missouri. As palaeontology knows no humans at that time, it was suggested the prints may come from a still unidentified large amphibian. The prints are discussed in great detail in Cremo et al. ( 1993, p. 454-458 ). Two things are evident : they must have been real prints, not fakes or eroded marks, or science would not have discussed them ; however, as the Paluxy prints ( see below ) show, the suggestion that they were made by a large amphibian must not be as outlandish as it at first appears to be. Berea : According to the "American Antiquary", 7/39, quoted in Michell & Rickard, p. 190, human footprints were discovered in sandstondin 1885. According to Professor W.G. Burroughs, human footprints have been found in Carboniferous layers in that state ( Cremo et al. 1993, p. 455 ). For a discussion, see above. Carson City : In 1882, prisoners quarrying in the Carson City jail discovered what appeared to be a human footprint 22 inches in length. In the time following, a larger number of these tracks were found, often in alignment, and a contemporary photograph shows at least five sets of about 15 prints each. The individual prints resembled those of a human foot clad in sandals ( Fort 1974, p. 164 ; Sanderson 1968, p. 41 ff ; Keel 1970, p. 57 ; Kolosimo 1971, p. 16 ; Steiger 1974 ; Michell & Rickard 1979, p. 190 ; Cremo et al. 1993, p. 807). As Carrington ( 1960, p. 144-148 ) had already pointed out ( but what believers chose to ignore ), the tracks were soon identified as those of a giant sloth. When Gary Mangiacopra ( 1996 ) reexamined the contemporary newspaper accounts and controversy for a paper on the Carson City jail prints for "Fortean Studies", he found the giant sloth identification completely convincing and added that "one of the most classic and oftquoted cases of the "unexplained" thus has the most mundane of explanations". Fisher Canyon, Pershon County : In 1922, the well-known fortean John T. Raid, a fossil collector, discovered a single and only partially preserved shoeprint in rocks 5 million years old ( Cremo et al. 1993, p. 808 ) or Triassic ( Cremo et al. 1993, p. 807 ) or 15 million years old coal layers ( almost all other sources, for example : Däniken 1990, p. 157 ; Tomas 1972 ; Mooney 1976, p. 25 ; Schneider 1976, p. 52 ; Däniken 1977, p. 327 ; Berlitz 1978, p. 189 ; Dopatka 1979, p. 204 and 409 ; Michell & Rickard 1979, p. 190 ; Fiebag 1982, p. 62 ; Kolosimo 1991, p. 105 ). Raid thought he could discern, in the fossil soleprint, "the minutest detail of thread twist and warp, proving that the shoe sole... is stictly the handiwork of man". Experts who investigated the find all concluded it was a natural formation although they were also struck by the close resemblance of the rock imprint to a shoe sole ( Cremo et al. 1993, p. 808 ), an impression one can hardly agree with seeing a photo of the actual thing ( Kolosimo and Cremo both have the same print, same reproduction size, but different rock outlines ! ) which simply looks like an oval depression in the stone surface, deep enough to cut through several layers, thus giving the impression of concentric lines within the form. Clayton : David Gilette of the New Mexico Museum found "human footprints" which confirmed Kubin’s Paluxy theory ( see below ), as they showed "almost identical coloration" ( Benjamin 1986, p. 20 ). White Sands : A trapper found, in 1932, 13 footprints in Gypsum formations, each one about 55 cm long and 20 to 25 cm wide. The prints are described in a State Department booklet, "The Story of the Great White Sands", quoted in Michell & Rickard, p. 190. According to Professor W.G. Burroughs, human footprints have been found in Carboniferous layers in that state ( Cremo et al. 1993, p. 455, see there for additional sources ). For a discussion, see under Kentucky. Brayton : Near the source of the Tennessee River there are human footprints in solid rock. The feet have six toes and are 33 cm wide. Close to them are giant hoofmarks ( Kolosimo 1971, p. 134 ; Warren Smith 1977, p. 140 ). Paluxy River near Glen Rose : Palaeontologist Dr. C.N. Dougherty discovered 140 million year old human tracks, often many in a line, alongside typical dinosaur tracks. Each human footprint is up to 54.61 cm in length and up to 20.32 cm wide. The Paluxy site is a favorite among creationists, who have written books and made videos about it. It is the single most widely reported find in the file of fossil human footprints, and has been used as evidence for human and dinosaur coexistence, ancient astronauts, creationism and a few other theories ( Wilder-Smith 1968 ; Dougherty 1971 ; Holiday 1973, p. 98 ; Däniken 1977, p. 318 ; Dopatka 1979, p. 408 ; Steinhäuser 1979, p. 131-134 ; Patterson 1985 ; Fiebag 1995, p. 263 ). However, in 1986, Creationist Glen J. Kuban discovered that the toes of the alleged human prints all showed a strange coloration that was the result of slick filling in claw marks - in simple words, although the prints appear human, they were left by dinosaur feet. The evidence was overwhelming, palaeontologists who - for no obvious reason but prejudice - had rejected the human prints as fake ( see Illies 1977, p. 89 ) now accepted them as genuine, and religious fundamentalists withdrew their videos on Paluxy ( Nature 19 June 1986, p. 722 and 2 October 1986, p. 390 ; New York Times, 17 June 1986 ; Time, 30 June 1986, p. 44 ; Science Frontiers 45, 1986 ; Benjamin 1986, p. 20 ; Magin 1987 ). Holiday ( 1973, p. 98 ) had already received an explanation about the print’s claws from the British Museum’s Department of Palaeontology but had refused to believe it. It should also be noted that the Paluxy tracks are in average only oval depressions, with a few more precise prints with three toes ( see the photo in Patterson ). This makes the very human-looking five-toed prints as reproduced by creationists, Däniken and Dopatka suspicious. There is the possibility that some of the dinosaur tracks were actually manipulated by locals or creationists to appear more human. Antelope Springs : In 1968, hobby palaeontologist and creationist William Meister discovered a single fossil shoeprint in the Wheeler Shale at Antelope Springs which is at least 440 million years old. It is 32.5 cm long, measures 11.25 cm at the widest point and 7.5 cm at the heel. The shoe must have squashed a trilobite which can still be seen. The print was analysed by Prof. Melvin A. Cook of Utah University, what he concluded has not been quoted ( Steiger 1974 ; Däniken 1977, p. 324 ; Berlitz 1978, p. 189 ; Dopatka 1979, p. 409 ; Fiebag 1982, p. 62 ). Cremo et al. 1993, p. 810-811 ) covers the find in some detail and quotes various geologists opinions, among them that it is "an oddity in weathering" or "the result of spalling, a natural fracturing of the rock". Even Cremo cannot bring himself to accept the anomalous nature of the alleged footprint and says vaguely that the "Meister print, as an evidence for a human presence in the distant past, is ambiguous". Notably absent from his discussion is the trilobite killed by the shoe, so it is safe to suppose that his examination of the print showed that this additional piece of evidence was wishful thinking. Rather than correcting the mistake of the anomaly seekers, he ignores it. Southwest Virginia : Tracks similar to the Carson City footprints ( see Nevada ) were discovered in 1991 in an ancient lake bed. The tracks measure three feet ( 0.9 m ) and they are about 13 500 years old, said Jerry McDonald of the Virginia Museum of Natural History. Scientists from the Smithonian Institution and the Cincinnati Museum of Natural History identified them as those of a ground sloth. It is the second such set of prints ever discovered, the first was, of course, at Carson City ( Washington Post, 6 August 1991 ; INFO Journal 64, 1991, p. 28 ). West Virginia : In 1896, according to Michell & Rickard, p. 190, the "American Anthropologist" described some 37 cm human footprints from West Virginia. Bathurst, New South Wales : Rex Gilroy, an amateur scientist, who is famous for discovering about anything imaginable in Australia, from Egyptian pyramids to surviving dinosaurs, has found human footprints in solid rock at Bathurst, west of the Blue Mountains. The feet have four toes and measure 60 x 18 cm. In close proximity, Gilroy has also discovered gigantic stone implements and monstruous fossil human teeth ( Däniken 1973, p. 181 ; Dopatka 1975 ; Däniken 1977, p. 328 ; Dopatka 1979, p. 297 ; Steinhäuser 1979, p. 134 ). Perhaps we should add that neither this, nor Gilroy’s discovery of a plesiosaur skeleton close by has ever been accepted as genuine. The photos in Dopatka ( 1979 ) shows a natural depression in stone looking remarkably like a human footprint. Kiribati : All over the archipelago, footprints in solid stone can be found, ranging from children’s feet to normal sized feet and even gigantic prints 1.37 m long and 1.14 m wide. One left foot print has twelve toes, but most of the prints show only six toes. In average, they are about 1 cm deep. These prints can be found on all 16 Kiribati islands, one on Tarawa near of the village of Antebuka. ( Däniken 1994, p. 60-65 ) denies that they have been carved, but on the photos he prints they look artificial. There is a scientific paper about them ( Turbott 1949 ) that I haven’t been able to consult. This list may appear like an arbitrary collection of "footprints in stone", mixing folkloric tales with scientific discoveries. It will become evident, however, that it makes an argument as well. The phenomenon of footprints in stone which are often explained as marks left by gods, saints, angels or devils, has a multi-causal origin : some of the footprints are only interpretations of naturally eroded cups, the rest are clearly prehistoric or later carvings. That is, the legends have grown around these footprints, and stories have been told to explain them. In a different class than these sacred prints appear to be those of human feet or shoe soles in geological layers. However, a close reading of the list shows that the same process was at work with the majority of the "fossil footprints" listed above. The footprints are often used by proponents of ancient astronauts or Atlantis. These are hardly the most reliable authors, and they often undertake their research with an agenda in mind. As those cases where the fossil footprints were clearly shown to be misidentifications prove, these "researchers" will not listen to logical explanations anyway. Each of the cases would deserve a separate study, certainly more than the brief summary that had to do in this article. Most of the finds are misperceptions : the Carson prints were those of a giant sloth, the Mongolia prints have been identified as fossil ripple marks, both "shoesoles" are a result of fracturing, and the Spanish print and the Australian print are clearly naturally eroded depressions. The Kiribati prints and the British one have been carved, probably for magical reasons. There is little difference between the folkloric reinterpretation of eroded rocks and what careless researchers have done. These prints are evidence only for self-delusion. The only cases worthy of consideration always appeared to be the footprints of Paluxy, where whole sets of human footprints had been found alongside dinosaur prints in the same geological layer. However, this case has been conventionally explained, as outlined in the relevant section above. Although more research is needed into the few cases where no definite identification has been possible yet, the conclusion at this point of time can only be that "fossil human footprints in solid rock" offer no evidence for the existence of humans in the far geological past. This may change tomorrow, but any other conclusion would mean to base too much speculation on too flimsy a fundament.